The syllabus will be updated weekly. Get a sense of the class; determine if it is a good fit for you. See Bios 311 Class Details and Bios 311 Syllabus 2013 for more information. Learn some of your classmates names. Get to know them a little. Learn all of the pig rolls, terminology, and scoring values. See roll values. Read Rosner Ch 1 and 2. By "read", skim to remind yourself of the parts you already know (should be most of it) and read to learn the parts you don't know. I'll lecture very briefly on these chapters Tuesday. Borrow a pig to take home for the weekend. Roll your pig 100 times and collect the outcomes, i.e. the number of times it landed on each of the six possibilities. On Tuesday, you'll enter your data into a spreadsheet and return your pig. Install R and RStudio on your laptop. On Tuesday, bring your laptops and books for class and lab. You'll be working problems from the text and a group quiz I'll hand out. Chapter 2 concepts, especially summarizing and describing data/distributions. The most important idea to understanding the "why" of statistical methods in the traditional paradigm, aka frequentist paradigm. # do I need to add Meredith? What is the distribution of theta.hat for a given theta? Can you run a bunch of experiments quickly? Due via email by the end of the day, aim for the end of class or lab, to keep from overdoing it. Here is how to read in the data. Q01) Using many of the summary statistics and plots from Rosner Ch 2, summarize the class' sampling distribution for theta.hat = the estimated probability of rolling a razorback from an experiment where N = 100 rolls. Q03) Pick one of your group's experimental results for theta.hat from the class' data. Based on what you've learned about sampling distributions from Q02, come up with a way of expressing your uncertainty about the true theta = probability of rolling a razorback. Justify your suggestion. I'm not looking for a certain answer here. I'm looking for deep thought about what sampling distributions reveal when you only get to see one experiment with an unknown theta actually performed. Get a vision of where we are going -- we want to carefully describe the uncertainty of our estimates. S = Sample space, A = event, Pr( A ) or simply P( A ) = probability. Venn Diagrams. Unions and intersections. Complements of sets and the Null set. Mutually exclusive events. P(A or B) = P(A U B) = P(A) + P(B). The addition law of probability. P(A or B) = P(A U B) = P(A) + P(B) - P(AB). Independence. Multiplication law of probability. P(AB) = P(A)*P(B). What this looks like in a Venn diagram. Conditional probability. P(AB)/P(B) = the conditional probability of A given B. What this looks like in a Venn diagram. Probability tree diagrams. Not in the book, but can help thinking through some problems of modest scale. 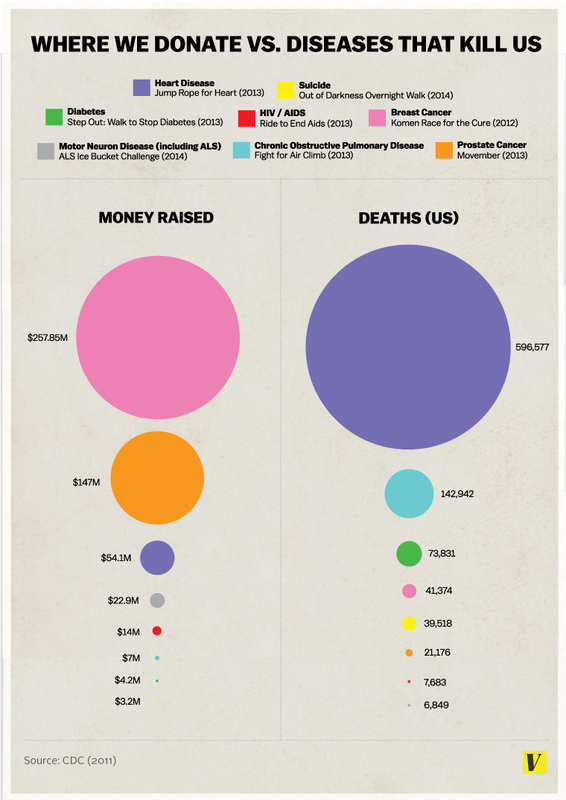 Fun aside: Donating.vs.Death-Graph from from Vox. NIH funding. interesting blog. Quiz discussion Describing uncertainty and reaching an impasse. Why we need to add some basic probability to our tool kit. Supplemental Lecture notes 010ProbabilityLecture.pdf This is optional reading, which you may find helpful. 3.1-3.6 Intro, Definitions, Notation, Multiplication law, Addition law, Conditional probability - these are key ideas we need to move our discussion forward. 3.11 Summary - usually a better intro than the intro. Work the problems from the beginning through the Genetics groups of problems 3.30 etc. The Genetics and Mental Health group of problems are especially nice for practicing the basic probability skills. 4.1-4.3 and 4.8 Intro, RV's, PMF (PDF for discrete distributions), Binomial Distribution - this is the other set of key ideas we need to move our discussion forward. Due via email by the end of the day, aim for the end of class or lab, to keep from overdoing it. Group B: Jonathan Jea Young Svetlana Alice T.
Q01) Using the rbinom() and hist() commands, graphically display and approximate pdf for X ~ Binom(100, 0.25). Comment on why this figure is an approximation and what influences the accuracy of the approximation. Q02) Using the dbinom() and plot() commands, graphically display and exact pdf for X ~ Binom(100, 0.25). Q03) Suppose you had rolled 22 razorbacks out of 100 rolls. Find a lower and upper bound (LB, UB) for the true probability of rolling a razorback using the following criteria. Note the pbinom() function and some trial and error may come in handy here. Q04) Check your answer for Q03 using the binconf() command in the Hmisc package for R.
Q05) Let X ~ Binom(100, 0.25). Let C = 1 if the exact 95% CI (akin to Q03 and Q04) contains the true value of theta, 0.25. Let C = 0 if it does not. Calculate E[ C ], i.e. calculate the true coverage probability for the 95% exact CI given X is Binom(100, 0.25). Q06) Let theta vary. Plot E[ C ] for a bunch of thetas ranging from 0 to 1. Compare the coverage of the exact 95% CI with the Bootstrap Credible Interval (see below) over a range of thetas, i.e. compare the "correct" answer to Q6 to the "incorrect" answer. Discuss how the answers compare. Is one method clearly preferable? Which would you choose and why? Look at another performance metric, CI widths. Discuss how the answers compare. Is one method clearly preferable? Which would you choose and why? Time permitting, try a few different N's, say 40, 500, and 3000. How does this impact your decision of which method to choose? A common solution goes like this. Note, we will call this the Bootstrap Credible Interval. We rolled 22 razorbacks out of 100 rolls. Suppose the true theta was 0.22. What is a reasonable range for the number of razorbacks we could roll if theta=0.22? Specifically, solve for the 2.5th and 97.5th percentiles of Binom(100, 22). The command qbinom() may be helpful here. This yields a set of bounds on the scale of X, the number of razorbacks rolled. Convert that range of razorback rolls into an upper and lower bound for theta, i.e. divide by 100. It turns out the logic of this approach is not far off from the logic of what we'll learn as the asymptotic normal confidence interval. Sequentially suppose a whole bunch of thetas going from 0 to 1. Which of those thetas are plausible given that we rolled 22 razorbacks? Eliminate any thetas where the probability of rolling a 22 or anything even more extreme for that theta is < 0.025. One way of expressing that is the two equations given in the quiz. Another is equation 6.20 in Rosner. <b>*Q01)*</b> Using the rbinom() and hist() commands, graphically display and approximate pdf for X ~ Binom(100, 0.25). Comment on why this figure is an approximation and what influences the accuracy of the approximation. <b>*Q02)*</b> Using the dbinom() and plot() commands, graphically display and exact pdf for X ~ Binom(100, 0.25). <b>*Q03)*</b> Suppose you had rolled 22 razorbacks out of 100 rolls. Find a lower and upper bound (LB, UB) for the true probability of rolling a razorback using the following criteria. # First, get a broad sense of where the threshold is. # until you reach your desired level of precision. # Likewise, solve for upper bound. <b>*Q04)*</b> Check your answer for Q03 using the binconf() command in the Hmisc package for R.
<b>*Q05)*</b> Let X ~ Binom(100, 0.25). Let C = 1 if the exact 95% CI (akin to Q03 and Q04) contains the true value of theta, 0.25. Let C = 0 if it doesn't. Calculate E[ C ], i.e. calculate the true coverage probability for the 95% exact CI given X is Binom(100, 0.25). # the number of razorbacks rolled. # so I ran this through a for loop. # reporting to four decimals is plenty. So for a Binom(100, 0.25), the 95% Exact Confidence Interval actually has 96.25% coverage. <b>*Q06)*</b> Let theta vary. Plot E[ C ] for a bunch of thetas ranging from 0 to 1. # First, let's turn Q05 into a function. # the exact 95% CI for a Binom(100,theta). # unless specified otherwise with return(). # a bunch of thetas. <b>*Extension:*</b> Now compare this to the bootstrap credible interval. Review the logic and performance of the exact and bootstrap confidence intervals for a proportion. Can you express these in words? Lay the foundation for the traditional confidence interval for a proportion, better called the asymptotic Normal confidence interval. Continuous distributions and the Normal distribution. Formal definitions of expectation and variance. Properties of expectation and variance, especially linear transformations vs. nonlinear transformations. Properties of sums of random variables. Touch upon the Central Limit Theorem. Rosner 4.4 and 4.5. E[X] and V[X] for a discrete distribution. Rosner 4.9. E[X] and V[X] for Binomial. Rosner 5.1 - 5.7. Continuous distributions, the Normal distribution, sums of RVs, and the Normal approximation of the Binomial. I will lecture for the first hour and leave the remaining class time and all of lab for the quiz. Due via email before class on Thursday in .pdf or .html format only. If your solution requires R code, please include the code in your document. Group A: Jonathan, Ying, Christopher, Derek. Group B: Travis, Alice T., Jea Young, Svetlana. Group C: Lauren, Ryan, Alice C., Andrew. Group D: Sam, Jie, Linda, Alex. Q1 Rosner's Ch 5 Nutrition set of problems, 5.6 - 5.9. Q2 Rosner's Ch 5 Nutrition set of problems, 5.21 - 5.24. Q3a Let X ~ Binom(20, 0.17). Let Y ~ N( mu=E[X], sigma=sqrt(V[X]) ), i.e. Y is Normal with mean and variance equal to that of the Binomial X. Take a large sample from each of X and Y and sort them from smallest to largest. Plot Y by X. By large, I mean try getting samples of 10^6. If that crashes your laptop, go with 10^5. Q4a-b Repeat Q3a-b for Binom(100, 0.17). Q5a-b Repeat Q3a-b for Binom(1000, 0.17). Q6 Discuss what Q3 - Q5 teaches us. A bullet point discussion is fine. Law of large numbers and central limit theorem. Due via email before class on Tuesday in .pdf or .html format only, including "Quiz 04" in the subject line. If your solution requires R code, please include the code in your document. This is take-home, solo submission, open everything and everyone. Seriously, talk to each other, talk to family/friends/professors, search the web, start a web forum, etc. Just remember you are academics and cite your sources. G0 Make sure you've replied to the email regarding the midterm dates. Rosner 4.37 - 4.41 (Renal) Hint: answers should be in the back of the book. Rosner 4.46 - 4.51 (Cancer Epidemiology) Hint: can use dbinom() in R instead of the Excel command suggested. G4.51a Following up on Rosner 4.51, let D = the total number of deaths over 8 hours. Solve for E[D]. G4.51b Following up on Rosner 4.51, let D = the total number of deaths over 8 hours. Solve for V[D]. Rosner 5.114 - 5.116 Hint: if I'm thinking about it correctly, 5.116 is a three star level problem, i.e. it combines several ideas and requires careful thought. Think about your rules for sums of independent random variables and linear transformations of variables. G1 Let X ~ N(0,1). Let L = 4*X + 17. Solve for E[L]. Hint: this is easy. G2 Solve for V[L]. Hint: this is still easy. G3 Let X ~ N(0,1). Let C = cos(X), where X is treated as radians so cos(3.141593) = -1. Solve for E[C] accurate to four decimal places. Hint: this is not easy. Before you try getting a precise solution, try taking a big sample of X and go from there. To work on a precise solution, first in R, try selecting a useful range for X then plot the pdf of X using dnorm(), plot C, and plot the pdf of C. To plot the pdf of C, think about what values should be on the x-axis and what values on the y-axis and how each relates to X. The following is the start of my solution, which is organized to help me easily sum up four values for P[cos(x)=a] for a bunch of values of a. # Split up X by the half-period of the cosine. # These are ordered emphasize the symmetry, which will help when I need to sum them up. # delta = the rectangle width for the numeric integration. This will let me control my level of accuracy for E[C]. # Think about why going from -2*pi to 2*pi is sufficient for this problem. # Evaluate C over this range. # Eyeball check that I've ordered them by the value of cos(x). Second, think carefully about the formal definition of expectation. Third, remember numerical integration from Calc 101. You don't have to get fancy with the numerical integration. I bet you can get four decimals of accuracy in R simply using very skinny rectangles. G4 Solve for V[C]. Hint: use your techniques and results from G3. Quiz 04, understanding expectation and variance a little better and thinking about the precision of estimators vs. the precision of calculations. Asymptotic Normal (Wald) interval for a proportion. Bring it all back to operating characteristics. # to get our bearings. # and compute the mean and variance. # Now let's see if we can get a more precise answer. # The pdf of C is related to the pdf of X. # in the arrays c2neg, ..., c2pos. # We can use any of the segments to plot the pdf. # over the span of c, [-1, 1]. # We can integrate numerically. # at four decimal places. # Evaluate C over these ranges. # Sum to get the pdf. Due via email by the end of the day Thursday in .pdf or .html format only. If your solution requires R code, please include the code in your document. Please cc Lucy. Some of these emails are getting buried in my spam folder. It will be nice to have a back up to make sure nothing gets lost. Group A: Alex, Travis, Ying, Alice C.
theta_hat -- Hint: what nice property does this estimator have? z_alpha/2 -- Hint: what is this and what important theorem justifies its use? theta_hat*(1-theta_hat) -- Hint: what is this estimating? sqrt( theta_hat*(1-theta_hat)/n ) ) -- Hint: what is this estimating and how would you derive it from the properties of sums of random variables? Q2 Suppose you rolled 29 razorbacks out of 100 rolls. By hand, calculate the asymptotic Normal 95% CI. Check your answer using binconf() in Hmisc. Q3 By default, binconf() calculates the Wilson Score Interval. See wikipedia. This interval and another popular interval, Agresti-Coull, are well approximated by simply adding two successes and two failures to your dataset and calculating the Wald interval using that updated data. Suppose you rolled 29 razorbacks out of 100 rolls. By hand, calculate the "add two successes and two failures" 95% CI. Compare your answer to the Wilson interval using binconf() in Hmisc. Q4 Let X ~ Bin( 40, theta ). Create a plot comparing the true coverage rates of the 95% CI over thetas ranging from 0 to 1 for the asymptotic Normal (Wald) interval, the Exact interval, and the Wilson interval. Q5 Following up on Q4, calculate the expected true coverage rate given all values of theta are equally likely. In mathspeak, let C = 1 if theta is contained in the CI and 0 otherwise. E[C | theta] is the true coverage rate for a given theta. E[ C | theta ~ Unif[0,1] ] is the expected true coverage rate given theta is uniformly distributed. Accurate to two decimal places, find E[ C | theta ~ Unif[0,1] ] for each of the three methods used in Q4. Q6 Repeat Q5 for Bin( 400, theta ) and Bin( 4000, theta ). Explain the practical implication of the results. Include any caveats you wish. Generic descriptions of asymptotically Normal CIs, "Exact" CIs, and bootstrap CIs. Applying those three approaches to data coming from other distribution/estimator dyads. Normal, Sample_mean with variance known (see Rosner Eq 6.6, 6.7). Normal, Sample_mean with variance estimated (see Rosner Eq 6.6, 6.7). Normal, Sample_variance (see Rosner Eq 6.15). Poisson, Lambda_hat (see Rosner Eq 6.23). Evaluating the performance of those approaches. Practice some basics (problems from Rosner). In class: Work in groups of any size of your choosing. No submission, focus on getting the ideas and answers. Write them up only as much as helps that process. There will be an overview discussion done purely on the board with lots of hand waving and jumping up and down. Due via email by the end of the day Tuesday in .pdf or .html format only. If your solution requires R code, please include the code in your document and/or as a separate file. The quiz is open everything. Group B: Derek, Ying, Jea Young, Alice C.
Group D: Alex, Jonathan, Alice T.
Q1 Suppose the number of wild turkeys I see in my backyard each morning is well modeled as a Poisson random variable. This morning I saw 3 turkeys. Using the trial and error approach akin to when we calculated the exact Binomial CI, calculate an exact 95% CI for the true mean of wild turkeys I should see in my backyard each morning. Report two accurate decimal places. Q2 Find a statistical package or fancy formula (hint: the Poisson has an associate with the Chi-sq distribution) to quickly calculate the exact CI for Q1. Report two accurate decimal places. What did you use and how do your answers compare? Q3 Suppose X ~ Pois(2). Calculate the true coverage rate of the "exact" 95% CI. Report two accurate decimal places. Q4 Suppose X ~ Pois(2). Calculate the true coverage rate of the asymptotic Normal 95% CI. Report two accurate decimal places. Q5 Suppose X ~ Pois(2). Calculate the true coverage rate of the percentile bootstrap 95% CI. Report two accurate decimal places. Q6 Suppose X ~ Pois(lambda). Explore the impact of different values of lambda on the true coverage rate of the "exact" 95% CI. Include in your presentation the smallest value of lambda where the exact interval behaved well, i.e. its true coverage rate was equal to 95% to two decimal places. Q7 Suppose X ~ Pois(lambda). Explore the impact of different values of lambda on the true coverage rate of the asymptotic Normal 95% CI. Include in your presentation the smallest value of lambda where the Normal interval behaved well, i.e. its true coverage rate was equal to 95% to two decimal places. Q8 Suppose X ~ Pois(lambda). Explore the impact of different values of lambda on the true coverage rate of the percentile bootstrap 95% CI. Include in your presentation the smallest value of lambda where the bootstrap interval behaved well, i.e. its true coverage rate was equal to 95% to two decimal places. Q9 On a random sample of N=10 patients on a new medication, the sample standard deviation of their blood pressures was a shocking 15 mmHg (I'd expect it to be around 10 mmHg). Using the confidence interval based on the Chi-squared distribution, calculate a 95% CI for the true standard deviation of blood pressure. Comment on whether I have reason to be concerned. Q10 Suppose X ~ N( 120, sigma=10 ) and a random sample of N=5 is taken. Using the confidence interval based on the Chi-squared distribution, calculate the true coverage rate accurate to two decimals. Q11 Suppose X ~ N( 120, sigma=10 ) and a random sample of N is taken. Explore the impact of different values of N on the true coverage rate of the Chi-squared based 95% CI for the standard deviation. Include in your presentation the smallest value of N where the interval behaved well, i.e. its true coverage rate was equal to 95% to two decimal places. Q12 Suppose X ~ Uniform( 100, 140 ) and a random sample of N is taken. Explore the impact of different values of N on the true coverage rate of the Chi-squared based 95% CI for the standard deviation. Include in your presentation the smallest value of N where the interval behaved well, i.e. its true coverage rate was equal to 95% to two decimal places. Q13 Suppose X ~ N( 120, sigma=10 ) and a random sample of N is taken. Explore the impact of different values of N on the true coverage rate of the percentile bootstrap 95% CI for the standard deviation. Include in your presentation the smallest value of N where the interval behaved well, i.e. its true coverage rate was equal to 95% to two decimal places. Q14 Suppose X ~ Uniform( 100, 140 ) and a random sample of N is taken. Explore the impact of different values of N on the true coverage rate of the percentile bootstrap 95% CI for the standard deviation. Include in your presentation the smallest value of N where the interval behaved well, i.e. its true coverage rate was equal to 95% to two decimal places. Confidence interval methods in the specific, e.g. the percentile bootstrap CI for the sample standard deviation. Confidence interval methods in the abstract, e.g. the percentile bootstrap approach. Examining the performance of confidence interval methods in the very specific, e.g. the true coverage of the percentile bootstrap 95% CI for the sample standard deviation for X ~ N(120, sigma=10) and N = 5. Examining the performance of confidence interval methods in the moderately specific, e.g. the true coverage of the percentile bootstrap 95% CI for the sample standard deviation for X ~ N(120, sigma=10) and N varies between 3 and 200. For class, you'll be getting your first formal experience with larger group collaboration in this class, as you'll be working to compare your Quiz 6 solutions with each other, resolve disagreements, and solve the problems you are stuck on. You'll want your laptops for this. We'll be aiming to work in three pairwise consultations starting with Phase 1. Midterm Exam Part 1 In-class, solo work - closed other people, open book, open laptop/calculator, closed wireless signals - place phones and laptops in airplane mode. Midterm Exam Part 2 Begins right after everyone has submitted their part 1. Take-home, solo submission, open other people including classmates/professors/web-forums/etc., open laptop/calculator. Midterm Exam Part 2 Due via email to Robert and Lucy before the start of class as a pdf, html, or Word docx only. Make sure to show your work potentially including R code for all problems. Midterm Exam Part 3 Due via email to Robert and Lucy by the end of the day as a pdf, html, or Word docx only. Make sure to show your work potentially including R code for all problems. One submission for the entire class. The entire class period is devoted to coming to a consensus on your answers. Both the class and lab period will be devoted to the collaboration on part 3. Confidence intervals for the difference between two sample means. One- and two-sample hypothesis testing for sample means. When the null hypothesis informs the variance. Read Rosner Chapter 8 and practice problems from chapters 7 and 8. Continuum of operating characteristics: Type I error vs. Type II error (Power) vs. Robustness vs. Persuasiveness. One-sample exact test for a proportion, Fisher's Exact Test. Thinking through picking a method to use, case study of equal variance vs. unequal variance two-sample t-test. Read Rosner Ch 8 and practice problems for 7 and 8. Make sure to try each method once, e.g. do at least one problem that uses Fisher's Exact Test, do at least one that uses the asymptotic Normal test for a proportion, etc. Focus repetition on the methods you find hard, not the ones you've mastered. Due via email before class on Thursday in .pdf or .html format only. If your solution requires R code, please include the code in your document and/or as a separate file. The quiz is open everything including each other, me, Lucy, and other instructors. Group A: Andrew, Jea Young, Christopher, Alice C.
Q1) When choosing between the equal and unequal variance two-sample t-test, Rosner suggests performing an F test on the sample variances and using the unequal variance test only if the F test is significant (presumably at a 5% level). Other introductory texts will commonly give the rule of thumb to use the unequal variance test only if the ratio of the sample variances is outside of (1/2, 2), i.e. the larger is more than twice the size of the smaller. Which rule do you recommend, or would you recommend a different rule? This is intentionally a very open-ended question designed to let you think through what would lead you to prefer one rule over another and explore all the different factors that could impact your answer. Q2) Prepare a brief presentation (< 5 minutes) to share and support your conclusions. We'll share these on Thursday. Thanksgiving Break. No Class or lab.